Early autumn is my favourite time of year. West swell begins to roll into the West Coast again, re-surging the various reef and point breaks back to life; the days are still reasonably long; amazing produce is abundant and inexpensive; and a plethora of delicious wild fungi begin to pop up in the coastal temperate rainforest, just waiting to be found by those keen enough to look. It’s an inspiring time of the year when you’re obsessed with creating food. 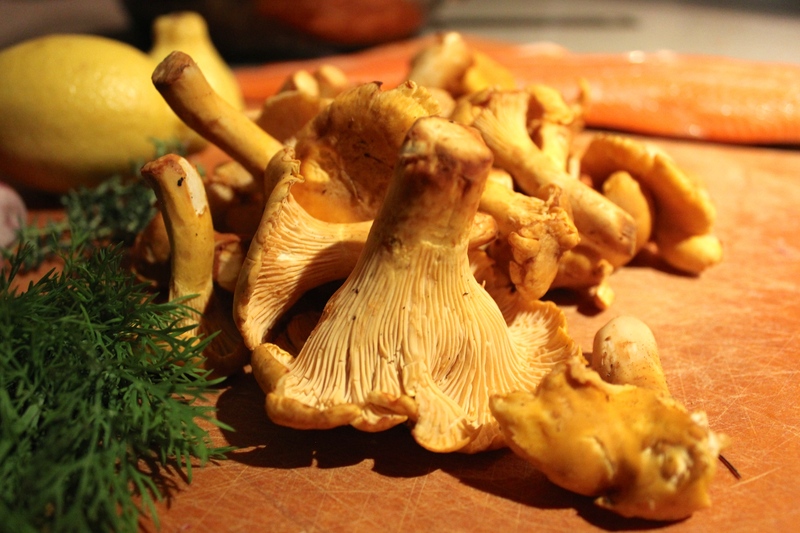 Trout with Chanterelle mushrooms is a classic and elegant combination. The dish could be further simplified to the point where the only additional ingredient is salt and pepper and it would still be outstanding. By adding a few finishing touches, the standout flavours are not compromised, but subtly accented. Exercise restraint when adding the ingredients, especially the butter, cream, and sherry. Cooking the trout requires some finesse as well, as the success of the dish hangs on achieving a beautiful crispy skin. Season trout fillets generously, proper seasoning is essential when cooking trout. 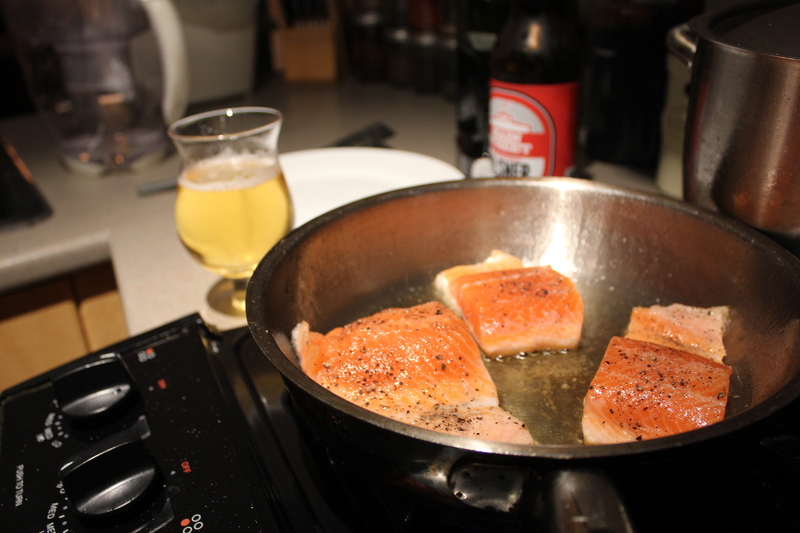 Heat a saute pan to medium heat, add olive oil, then add the trout fillets skin side down just as the oil starts to heat up. Do not wait for the pan to heat up to searing temperatures, since the skin will shrink and ruin the fillet if heated too quickly. Continue to cook for about 6-8 minutes, or until the skin is crisp and comes away freely from the pan. If the skin is sticking, the pan is either too hot, or hasn’t crisped enough. 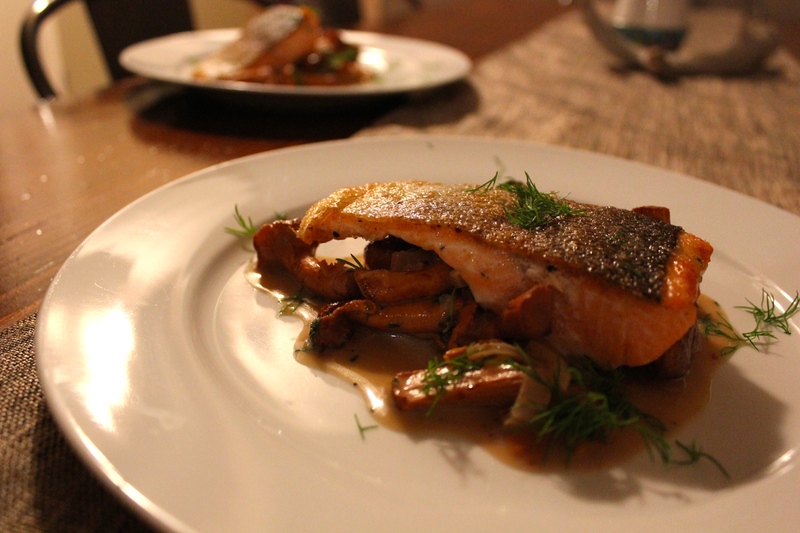 Flip the trout and cook for 1 minute, then transfer to a plate in a 180 degree F oven to hold while mushrooms cook. For the next steps, you’ll need to work quickly so that the trout does not sit more than a few minutes. Turn the heat on the pan up to high, and wait 30 seconds or until it reaches searing temperatures. 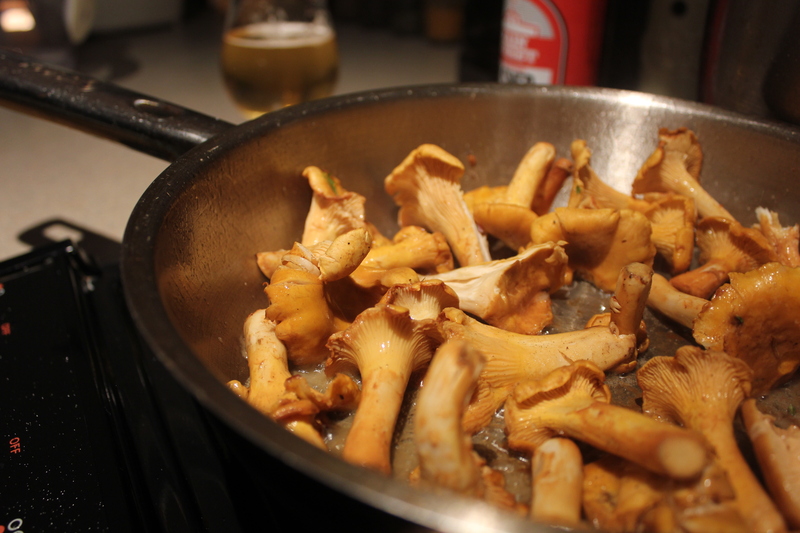 Add the chanterelles to the hot pan, ensuring they are not crowded (otherwise they will steam and not caramelize). Allow to cook undisturbed for 2 minutes. This is about as crowded as I’ll ever cook mushrooms. Any more, and they will steam. Add the shallots, butter, and thyme to the pan then toss the ingredients together in the pan to incorporate. Cook for 1 minute, then add the lemon, cream, and sherry. Continue to swirl the pan and allow liquid ingredients to reduce for 1 minute, or until a sauce like consistency is reached. Remove from heat, then add half of dill. Spoon the mushrooms onto a warm plate, then top with the trout fillet. Garnish with the remaining half of dill leaves.